Regular blog readers will know that I spend some time on the south coast in Worthing and that I often post reports from there. 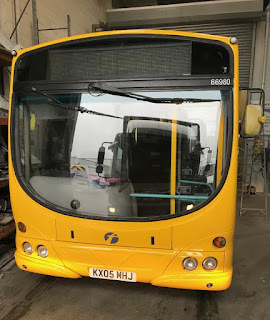 The main bus operator in the area is Stagecoach South and a source from the company has sent me some information regarding the first deliveries of thirty brand new Alexander Dennis Enviro 400MMCs to be based at Worthing for use on the Coastliner 700 service. A number are initially going into 'dry storage' at Climping outstation near Littlehampton although one has arrived at the Worthing depot in Library Place. They are due to enter service during the summer. My thanks to my mole at Stagecoach South for the information and photo. Lowestoft based Angie's Tours has recently re-registered one of its King Long XMQ6127 coaches. 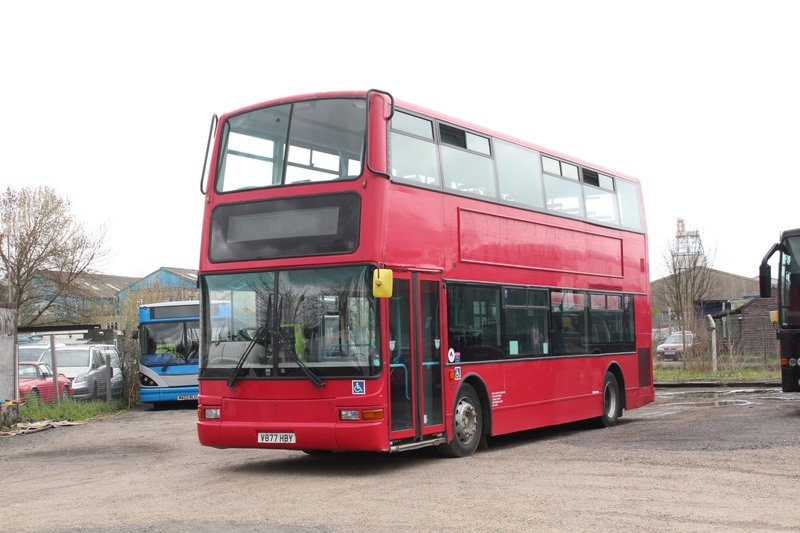 New to Wheelers Travel of North Baddesley in October 2009, BX59KWR has just received a replacement TIG3393 plate. The coach had been previously acquired by North Quay Services, trading as Eurosun, in April 2012. Mark Doggett has been out and about with his camera and came across an old FEC vehicle now plying its trade in Kent. V877HBY was new to First London (Capital Citybus) as TN877 in 1999. It was renumbered 32877 in 2003 and then passed to First Eastern Counties in 2008. It then moved on to First Essex in 2010 and then on again to First Midland Red in 2012. When Sold by First it passed to Bus Stop, Gravesend before moving on to its current owners Brian Jones Coaches also based in Gravesend. I managed to photograph her in Castle Meadow, Norwich back in September 2009 when the influx of ex First London Tridents and Volvo's was well underway with FEC. Thanks to Mark for the photo and the find! Yesterday's Notices & Proceedings Report included a retrospective application by Konectbus to vary the route and timetable of its Norwich St Stephen's Street to Horning 5B service from 12th April 2018. 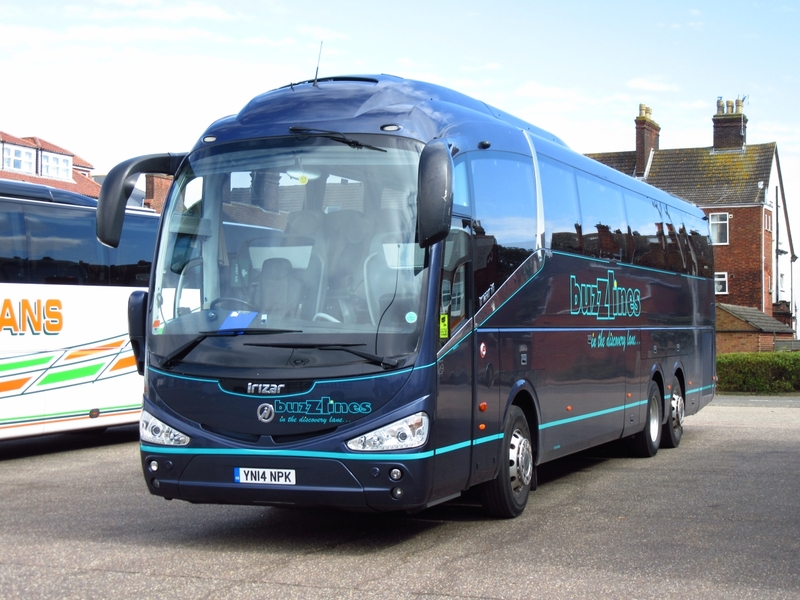 First up was Van Hool TX16 BT62KHF which was noted at the Hotel Victoria working for the Opal Travel Group. The TX16 was new to Harry Shaw as 1KOV in September 2012. Next on the itinerary was Marine Parade where I expected to observe some Shearings /National Holidays coaches but there were none to be seen! There was, however, an Ambassador Travel coach YN16UAF in Grand UK Holidays but, on cue, National Holidays Mercedes Benz Tourismo NH15LDH passed it heading for the nearby Royal Hotel. 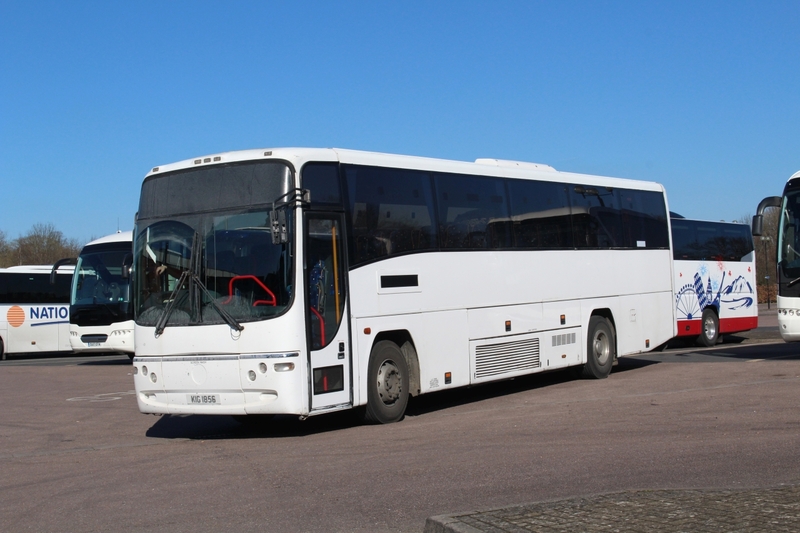 Also at the coach station was Alfa Travel's Mercedes Benz Tourismo 81 BX14LCK having a later start. Two different tourers appeared outside the New Beach Hotel on the two occasions I passed it. Laying up overnight was AVA Coach.Com's Van Hool Alizee bodied Volvo B12B F5AVA, new to Lakeland Coaches as YJ08NSU. 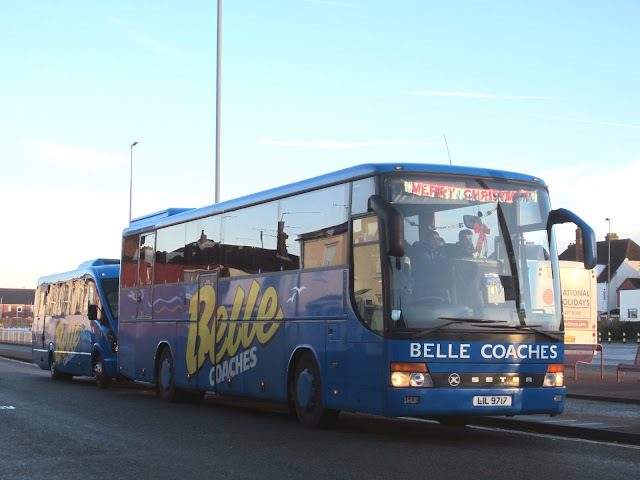 With no train services between Lowestoft and Norwich yesterday, a rail replacement service operated with Belle Coaches providing some of the vehicles required. Here is Setra LIL9456 on the 11:46 Lowestoft to Norwich. 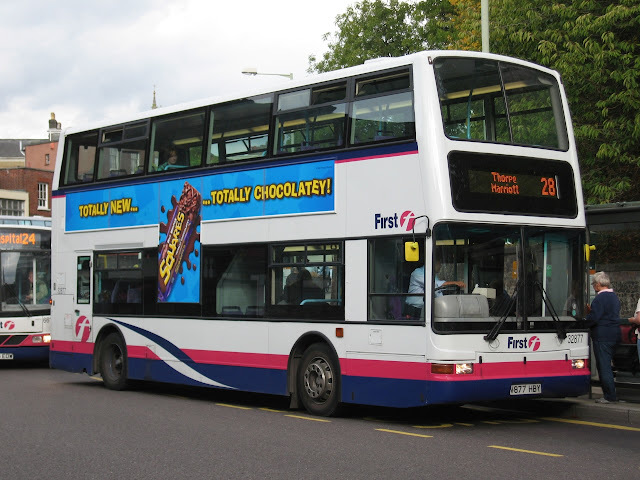 Also used on First's 101 Hollow Grove to Lowestoft Bus Station route was Gemini 37570 AU58ECT on the delayed 12:15 service. It was providing lunch time cover for Enviro200 44533 SN62DBV. My thanks to our regular Lowestoft correspondent Simon Bartram for his report and photos. 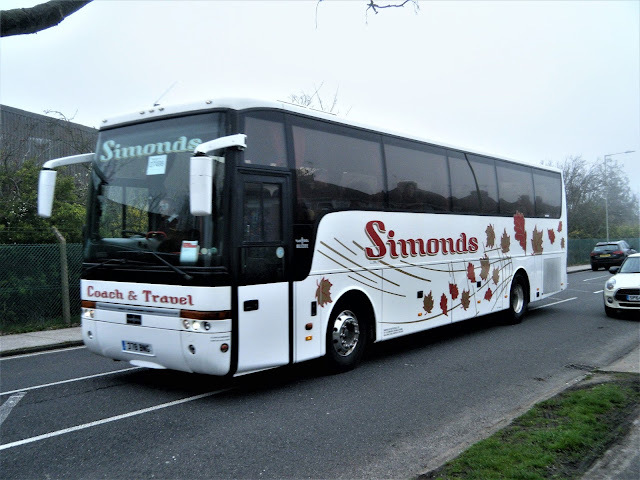 Two of Reynolds Coaches' former Mercedes Benz Tourismos have now been tracked down with their new owners in Newquay, Cornwall. Both BU04FAJ and BX55FYO were noted as being advertised for sale on the Route One database in early February last year and were acquired by A2B of Newquay soon after. Reynolds bought the latter from Clarkson of South Elmswell in April 2011 with the former coming from Bennett of Hayes End just a year earlier. Grahame reported on its proposed future use on 11th April 2018 (First Yarmouth Update) following the decker's return from storage at Lowestoft depot. 32809 was originally on loan at Great Yarmouth to cover for vehicles required for Bernard Matthews contract work leading up to the busy Christmas period. The two other Tridents, arriving at the same time, were noted in the rear yard at Caister Road in late March this year. Both 38201 T801LLC and 32849 T849LLC are thought to be available for disposal. It was new to Parks of Hamilton as KSK950. My thanks to @fpp5t on twitter for the photo and the information. As a result of resignalling work there was no rail service running between Lowestoft and Norwich yesterday. This led to rail replacement services being put in place with members from the Simonds and Belle Coaches being observed in use. A couple of sightings to note in Great Yarmouth earlier today and both were of the blue variety! 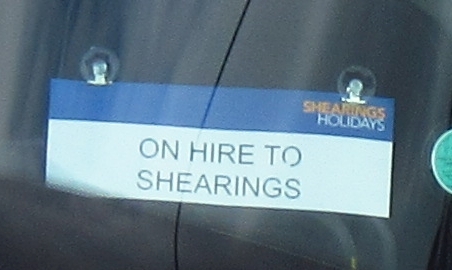 Firstly, Shearings Holidays' Setra 640 BT63GDA was being loaded outside the Carlton Hotel ready for the return home. Meanwhile, close to Railway Station was Freestones Coaches Irizar PB bodied Scania K380EB4 YN07LFY. It is thought to be on standby for rail replacement work; although I could see no mention of it on the Greater Anglia website. A few bits to report from Caister Road. 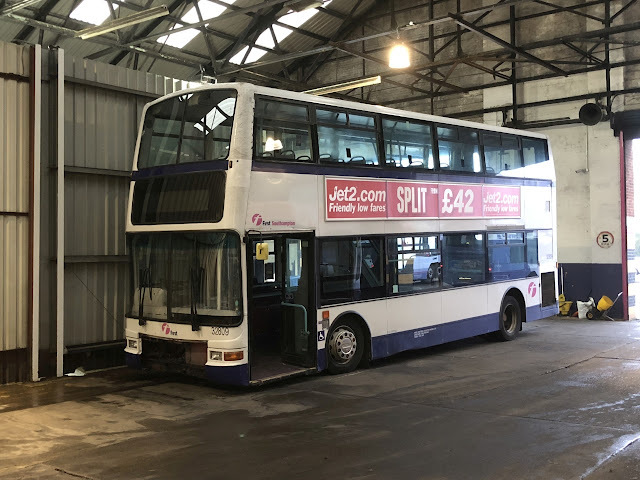 Firstly we are told that former First Southampton Trident 32809 T809LLC is to become a Driver Training vehicle. It was on loan at Yarmouth over the Christmas period before being withdrawn at the end of February. It has been stored at Lowestoft Depot before being towed back to Caister Road earlier this week. 32809 now back at Caister Road. A couple of Norwich vehicles are also at Caister Road for MOT and servicing, these being Streetlite 63321 SK65PXB which is part of the Green Line fleet along with recent arrival from Leeds 36271 BG12YKD which was noted on Sunday afternoon. 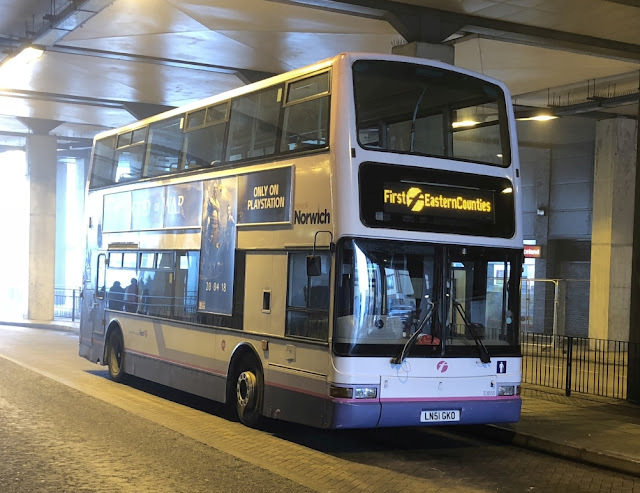 And finally also from Norwich, Dennis Trident 33055 LN51GKO was spotted this morning at Market Gates Bus Station in the town. Thanks to First for the info and to Will Drake for the photographs. This morning's Notices and Proceedings Report contains a couple of entries of local interest. The first relates to the variation of a service by Sanders Coaches which has been granted under short notice. It concerns the amendment of route and timetable of the 98 service between Cawston Market Place and Fakenham from 29th April 2018. Ipswich Buses is cancelling its Felixstowe open top service effective from 1st July 2018. 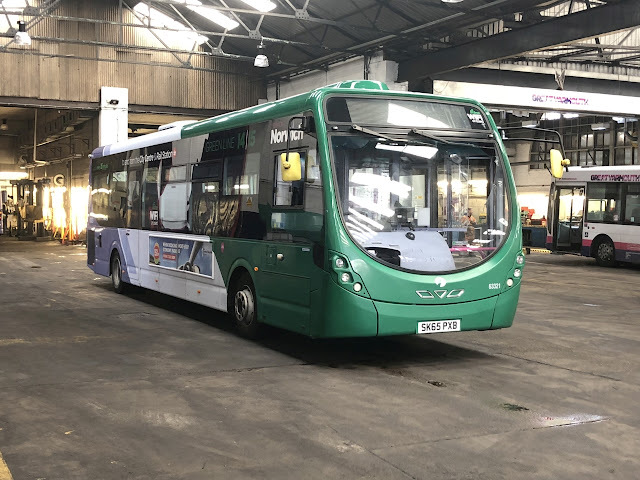 Paul Bennett has been in touch regarding the latest First Norwich Yellow Line repaint at Simon Morris in Ipswich and it's not an ex Leeds Volvo B9TL! This morning Rob Freeman took this photo of Volvo B7RLE /Wright Eclipse-Urban 66980 (KX05MHJ) and note the revised First logo. It is expected to be heading back to Norwich along the A140 later today. My thanks to Paul for sending the photo to me and to Rob for taking it. As Grahame reported on the blog in mid March, (see More Streetdecks for Norwich) the two former Bristol buses have begun to appear in service and 35150 (SN65OMU) was noted in use earlier today. My thanks to Joe Wilson-Smith for supplying the photo which was quickly taken on his mobile phone as 35150 suddenly appeared whilst entering Red Lion Street from Castle Meadow. Following on from Roy's post, Mark Doggett has been in touch to say he found a former Ambassador Travel Volvo now working from a new home. KIG1856 was new to Ambassador for National Express duties as FN52HRG with fleet number 196. Pictured in Stratford Upon Avon back in February, KIG1856 is now operated by ALS Travel of Lake on the Isle Of Wight. I also understand that sister, former Ambassador 197 KIG1857 (FN52FRM) is also owned by ALS. Thanks to Mark for the photograph. 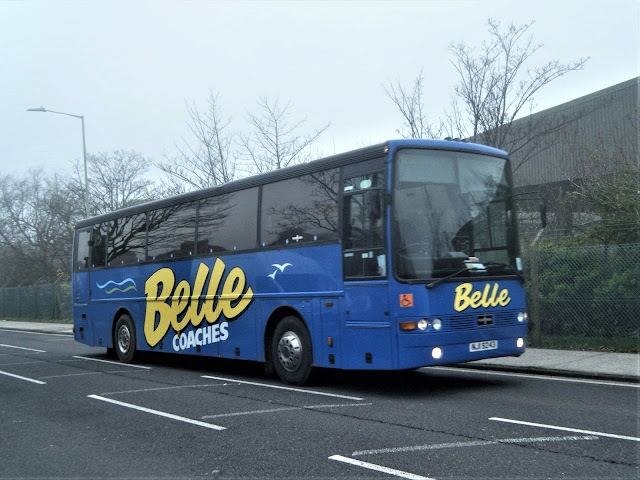 Two of Belle Coaches' previously operated Setras have been traced to latest owner D A Payne Coach Hire Limited of Offord Cluny in Cambridgeshire. 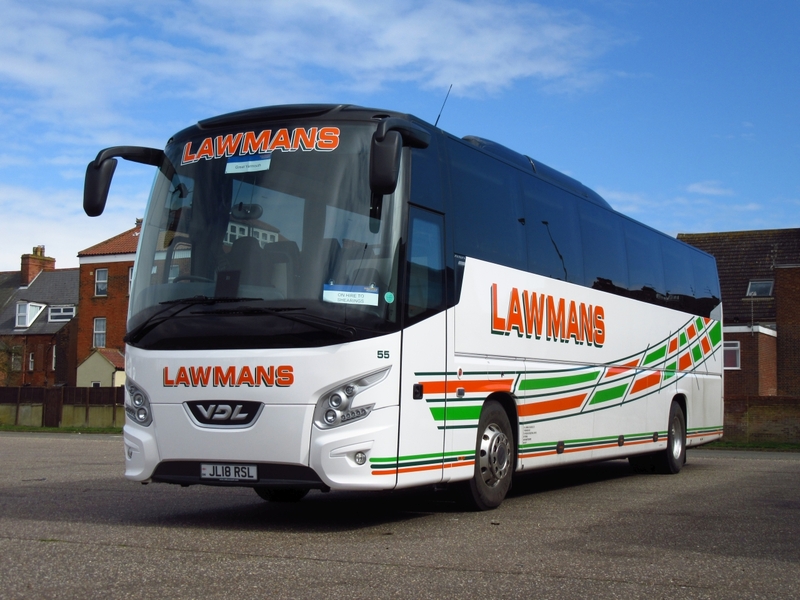 Today's Notices and Proceedings Report contains details of an alteration to Buckland Omnibus Company's operator licence. Its premises at Base Business Park in Rendlesham near Woodbridge is now authorised for six vehicles. I understand that Plymouth Citybus have a number of their Mercedes-Benz Citaros going on loan to Konectbus in the near future. 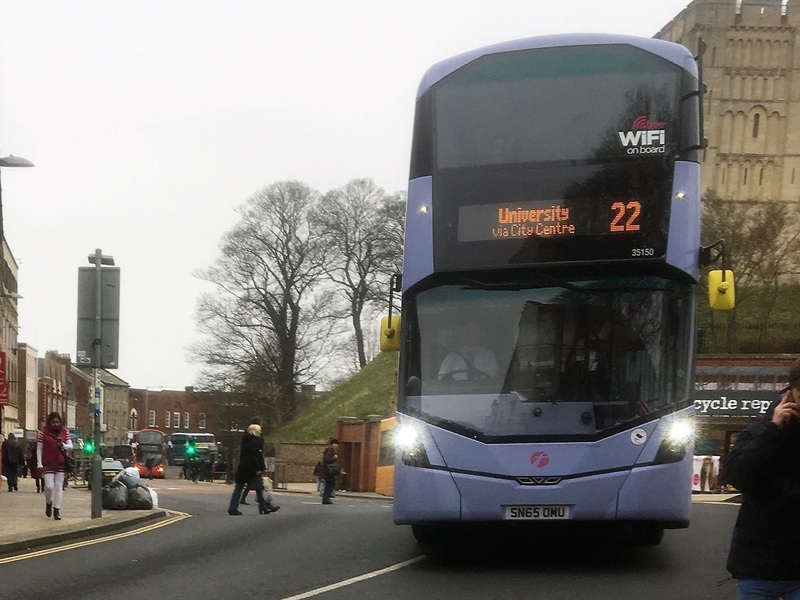 Their intended use is for the Neatherd High School routes on schooldays and they may also be found on other routes during the weekends and bank holidays. Another Plymouth bus heading to the Norfolk operator on loan is an Alexander Dennis E400 for use on the 5 series routes. 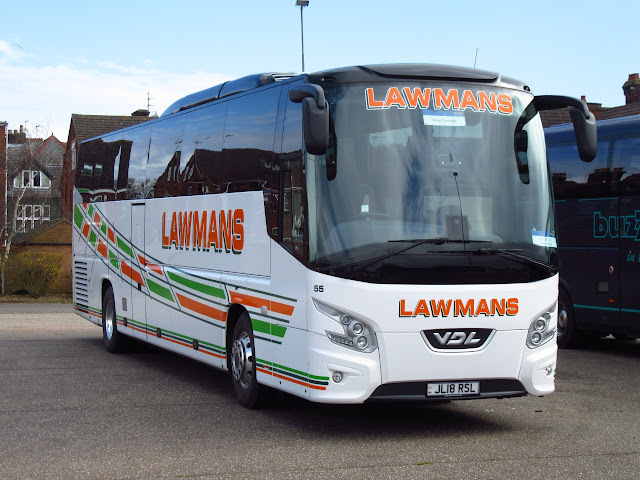 Noted this lunchtime at Beach Coach Station was a brand new VDL Bova Futura belonging to Lawmans of Kettering, JL18RSL was also carrying paperwork showing that it is currently on hire to Shearings. Also parked up was an impressive Scania Irizar YN14NPK operated by Buzzlines of Kent.